Tex Year endeavors to develop adhesives for tape industry. Eco-friendly is one of the most important objectives in this industry. We offered a complete series of HMPSA and WBPSA after we had redefined this industry. Tex Year will offer total solutions for tape industry through innovation and performance improvement. Those solutions apply on tamper proof courier tape, masking tape, single/double side tape, gummed kraft paper, duct tape, fiber glass tape, and dust removal tape. Offer various glues for courier bags to different customers. Our glues have material failures with operations under both high and low temperatures. Excellent bonding on the substrates, cotton, PET, and PVC. Widely applied to courier bag, printing industry, stationery, auto fleece tape, floor marking, pipeline wrapping. HMPAS for masking tape can be customized based on different operation temperature and paper properties. The applications can be fixation. Shading, painting, designing, electroplating processing. Remove dust from clothe, clean upholstery furniture, and manual roller. The special design allows our glue to effectively remove particles and avoid repeated pollutions. Excellent bonding insulation ducpt tape made up of thermal compound of polyethylene &gauze fiber, is normally applied to carton sealing, carpet veneering, heavy duty bundling, water proof packaging, and flue pipe seaming of AC. Glass fiber tape made up of high tensile strength glass fiber materials, is characterized by stab resistance and tear resistance. This is applied on metal materials winding, tubular bundling, car painting, bonding of electronic cooling device. 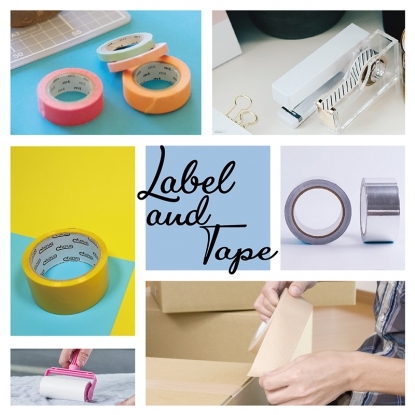 Tape made up of coater free gummed kraft paper is characterized by hand writing friendly, easily torn with no residue, wide range temperature resistance, no oil ooze, breakage resistance. It’s applied to carton closing, label making and packaging.